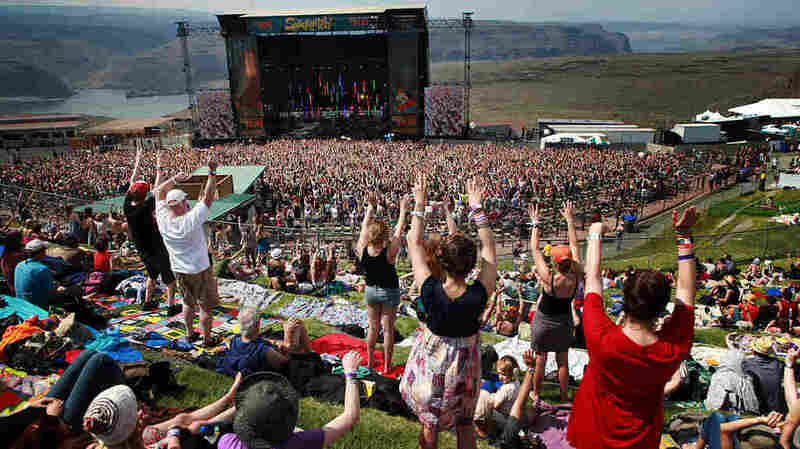 The Exclusive Value Of A Ticket To Bonnaroo, Lollapalooza And More 2012 Summer Music Festivals : The Record Our statistics-based guide to the music festivals of summer 2012 filters the bills at Bonnaroo, Sasquatch, Lollapalooza and more than a dozen others for exclusivity. The dance party that erupted as Chromeo played the main stage at Sasquatch in May of 2011. In summer music festivals, as with TMZ news scoops and the vintage car market, exclusivity is the name of the game. The thinking goes like this: Festival attendees are looking for a good time and a good deal. They're more likely to pay the high cost of a ticket to a multi-day festival with dozens of bands if the festival is their only chance to see some of those bands. As we did last year, we wondered what the huge number of festivals around the country would look like if you could judge them by their exclusive bookings, that is, if you look at more than 20 summer festival lineups and eliminate any act that appears on more than one. Of course, there's more to the notion of exclusivity than simple numerical elimination: Some bands are bigger draws than others. Some areas of the country (Chicago, the state of Washington) have more than their share of big festivals. Not all ticket prices are equal. But for the sake of not driving ourselves crazy, we'll focus on a limited set of purely quantitative analytics, and leave the which-headliner-is-better fights to the rest of the Internet. This is not a list of festivals we think you should attend. Not every festival on this list has released its complete lineup, so exclusivity ratings are subject to change. "Exclusive" acts may appear on festival bills not included in this data set. Festivals take place in the U.S.A. between Memorial Day Weekend and Labor Day Weekend. Sorry Coachella. Sorry Hopscotch and ATP. Festivals must be multi-day (no dice, Summer Jam) but must take place over a consecutive string of days (you're out, Celebrate Brooklyn). Summerfest, in Milwaukee, sneaks by this restriction on a technicality. It takes place over 11 days in June and July, with a Monday off in the middle. May 25 - 28 in George, Wash.
What It Looks Like After Elimination: A modest but tasteful bill with an indie and comedy-heavy lineup and a few booking triumphs that end up looking like the hits and misses of the MP3-blog era and beyond. Remaining Headliners: Beirut, Jamey Johnson, Clap Your Hands Say Yeah, Shearwater, Shabazz Palaces, Spiritualized, Ted Leo and the Pharmacists, Tenacious D, John Reilly and Friends, Hospitality, Portlandia, Awesome Tapes from Africa. May 26 - 28 in Detroit, Mich.
What It Looks Like After Elimination: This was supposed to be the year that big festivals poached major electronic acts from the Electric Whatever circuit, but the Detroit's decade-old festival is one of the most deeply-curated and (as Sami Yenigun pointed out) diverse in the country. Remaining Headliners: Carl Craig, The Wizard a.k.a. Jeff Mills, Public Enemy, Lindstrom, Juan Atkins, Matias Aguayo, Actress and scores more. May 31 - June 3 in Ozark, Ark. What It Looks Like After Elimination: Many of Wakarusa's heavy hitters show up as the token jam/roots bands on other festival bills, but even though last year's exclusivity champ has slipped a little bit, there will always be dudes who play guitars with their beards ready to step into the void. Remaining Headliners: Edward Sharpe and the Magnetic Zeros, RJD2, Slightly Stoopid, Primus, Balkan Beat Box, Tinariwen, Lyrics Born. June 2 - 3 in Philadelphia, Penn..
What It Looks Like After Elimination: A small rap-leaning lineup with throwback favorites and more electronic artists than you'd figure given the "organic" cred the festival's namesake has long been known for. Remaining Headliners: De La Soul, Rakim, Kid Cudi, Mr. MFN eXquire. June 7 - 10 in Manchester, Tenn.
What It Looks Like After Elimination: It's got the biggest lineup of any festival this summer, so there's going to be plenty of overlap. But the exclusives at Bonnaroo, which books with ambition and a genre diversity in mind, put most other fests to shame. Remaining Headliners: Radiohead, Danzig, Black Star, Ludacris, Kenny Rogers, Gza, Foster the People, Aziz Ansari. June 23 - 24 in Atlantic City, N.J.
What It Looks Like After Elimination: The "dude"-heaviest lineup stays pretty dude-heavy, even after you eliminate the handful of dudes (including festival organizers Metallica) who make appearances elsewhere this summer. Actually, the genre of this entire festival might well be described as "heavy dudes" or "heavy, dude." Remaining Headliners: Arctic Monkeys, Avenged Sevenfold, Suicidal Tendencies, Best Coast, Eric Church, Modest Mouse, Cage the Elephant, F----- Up. June 27 - July 1 and July 3 - 8 in Milwaukee, Wis.
What It Looks Like After Elimination: Summerfest, which has trademarked the term "The World's Largest Music Festival," is celebrating its 45th anniversary this year. More an oversized county fair than a festival with a real perspective, everything here — country, classic rock, roots, DJs, rap, reggae, jam bands, marching bands, cover bands, exclusive bookings and overlap with other festivals alike — feels like a fluke. Or a the weirdest radio blaring from behind the counter in a gas station you've ever heard. Remaining Headliners: ZZ Top, Train, Thievery Corporation, Sublime with Rome, Steve Miller Band, Squeeze, Robyn, Rascal Flatts, Paul Oakenfold, Neil Diamond, Morris Day and the Time, Lady Antebellum, Kool & the Gang, Kelly Clarkson, Kellie Pickler, Jimmy Cliff, Iron Maiden, Hanson, Gov't Mule, Fountains of Wayne, Darius Rucker, Common, Cheap Trick, B-52s. July 5 - 8 in New Orleans, La. What It Looks Like After Elimination: The summer's most exclusive festival only has 3 bands who overlap with other fests on this list: D'Angelo, Gary Clarke, Jr and Rebirth Brass Band. Those three are nice, sure, but even without them, Essence would scratch just about every soul/r&b/gospel itch you might have. Remaining Headliners: Aretha Franklin, Mary J. Blige, Kirk Franklin, Fantasia, Mary Mary, Eve, Trey Songz, Estelle, SWV, Dru Hill, Keyshia Cole, The Pointer Sisters, Robert Glasper Experiment. July 12 - 14 in Mariaville, N.Y.
What It Looks Like After Elimination: Wherein the dominance of the large-scale live touring market by jam bands and electronic music begins to make perfect sense. Also, one of the few festivals where the organizers (The Disco Biscuits, in this case) are an exclusive at their own festival. Take notes, Metallica and The Roots. Remaining Headliners: The Disco Biscuits, Amon Tobin, Crystal Castles, Lotus, Dada Life. July 13 - 15 in Chicago, Ill.
What It Looks Like After Elimination: Pitchfork's favorite bands, or bands that will soon become the site's favorite bands, minus bands who have been the site's favorite bands long enough to catch on with other festival bookers, plus bands who have been out of circulation long enough to have been forgotten about by other festival bookers but not so long they're due for a mass-market resurgence. Remaining Headliners: Godspeed You! Black Emperor, Vampire Weekend, Hot Chip, The Field, Chavez, Tim Hecker, Japandroids, The Olivia Tremor Control. July 13 - 15 in Louisville, Ky.
What It Looks Like After Elimination: Roots bands, world music stars, second-tier indie bands and a big star or two. Call it modest ambition or Bonnaroo Radius Clause Syndrome. Remaining Headliners: Wilco, Dean Wareham, Wye Oak. July 20 - 22 in Dover, Del. What It Looks Like After Elimination: A small festival located at the Dover International Speedway, near Delaware bay, Firefly doesn't have many exclusives, but the ones it manages to snag are notable. Remaining Headliners: John Legend, OK Go, The Killers, The Flaming Lips, The Wallflowers. July 20 - 21 in Seattle, Wash.
What It Looks Like After Elimination: Once you strike festival hogs like Fitz and the Tantrums and Major Lazer from the roster, more than half of the bands exclusive to Capitol Hill Block Party — which began in 1997 as a truly local event and has grown into a major national draw — are Seattle-based or affiliated. Remaining Headliners: Aesop Rock, Crystal Stilts, John Maus, Dam-Funk, Porcelain Raft. But those bands aren't the reason you're here. July 28 - 29 in Newport, R.I.
What It Looks Like After Elimination: Pretty much the same as it did before elimination, but without crossover acts like My Morning Jacket, tUnE-yArDs and Sharon Van Etten. Newport plays it straight, narrow and friendly, with a focus on roots and harmonies, which is why there's so much overlap with other festivals. Remaining Headliners: Iron & Wine, Jackson Browne, Conor Oberst, Guthrie Family Reunion. July 28 - 29 in Randall's Island, N.Y.
What It Looks Like After Elimination: Located on Randall's Island, between Manhattan and Brooklyn, this festival is distinguished by its High Times-curated Reggae stage and a silent disco tent where all attendees listen to the same set via wireless headphones. Remaining Headliners: Snoop Dogg, TV On The Radio, Matt and Kim, Hercules and Love Affair, The High Times Cannabis Cup Band. August 3 - 5 in George, Wash.
What It Looks Like After Elimination: The first year of the Live Nation-promoted festival comes across like Newport, but for country music, with a mix of huge stars, newcomers and crossover artists. The fact that this is 2,000 miles from Nashville is either a great idea or an impending disaster. Remaining Headliners: Dierks Bentley, Dwight Yoakam, Miranda Lambert, Blake Shelton. August 3 - 5 in Chicago, Ill.
What It Looks Like After Elimination: Lolla's monster 270-day, 300 mile radius clause means that exclusives here are huge acts the festival can afford to stake its name on and up-and-comers who can't afford to turn down the exposure offered. Everyone in the middle just books Bonnaroo or Sasquatch. Remaining Headliners: At The Drive-In, Avicii, Black Sabbath, The Afghan Whigs, Florence + The Machine, The Weeknd, Frank Ocean, Kaskade, Neon Indian, Madeon. August 3 - 5 at Pendarvis Farm, Ore.
What It Looks Like After Elimination: Again, a festival that veers from the indie/mainstream/dance trident made popular by Coachella scores a high exclusivity rating. This one, on a farm outside Portland, features "indie roots" acts on stages inside barns, under the stars and set between camp sites. Bet on acoustic instruments and sing-alongs. Remaining Headliners: Phosphorescent; Langhorne Slim; Kitty, Daisy & Lewis; Laura Gibson; Hot 8 Brass Band; Y La Bamba. August 10 - 12 in San Francisco, Calif.
What It Looks Like After Elimination: The second-lowest exclusivity rating belies this festival's ability to book notable acts for their only American festival appearances of the summer. Not exactly hip, but something here for everyone. Remaining Headliners: Stevie Wonder, Regina Spektor, Neil Young & Crazy Horse, Norah Jones, The Kills, MSTRKRFT, Grandaddy, Dirty Dozen Brass Band. September 1 - 3 in Seattle, Wash.
What It Looks Like After Elimination: A local event since 1971, Bumbershoot has always (seriously, check out the history here) been a diversity-first festival. Jazz, blues, roots, avant-classical, poetry comedy, experimental theater and film share the stage with the world's biggest mainstream rock acts. Since the mid-'90s, the rising indie scene has come to dominate. Remaining Headliners: Gotye, Jane's Addiction, Tony Bennett, Keane, Mudhoney, Wanda Jackson & the Dusty 45s, Fishbone, The Jayhawks, The Vaselines. September 1 - 2 in Philadelphia, Penn. What It Looks Like After Elimination: We're not counting "And More To Be Announced" as an exclusive, but still, this Jay-Z-curated festival has some heavy hitters. Remaining Headliners: Pearl Jam, Jay-Z, X, Rick Ross, Janelle Monae, Afrojack, Odd Future.